JESUS DE OTORO, Honduras – The “Red Bishop” of Honduras says he will run for president of the Central American nation if he gets permission from Pope Benedict XVI. Bishop Luis Santos Villeda of Santa Rosa de Copan will celebrate his 75th birthday in November and plans to immediately submit his resignation to the Vatican, as required by canon law. Once his resignation is accepted and he is freed from the responsibilities of bishop, Bishop Santos says, he will run for president as a candidate of a progressive faction of the Liberal Party, whose last president, Manuel Zelaya, was deposed in a 2009 coup. “I don’t aspire to be president of Honduras. This isn’t my idea,” Bishop Santos told Catholic News Service. He said he was first asked by Liberal Party leaders in the 1990s, and again in 2009, to become a candidate, but both times he declined. “But now that I’m retiring as bishop, I hope to speak with the pope and get his permission. I would no longer be bishop or have any church office, but would remain a priest. I could celebrate Mass privately in the morning before showing up in the presidential office at 8 a.m.,” Santos said. Bishop Santos has long been a public supporter of the Liberal Party, whose red flag contributed to his nickname. He was also a strident opponent of the 2009 coup, a position that put him at odds with Tegucigalpa Cardinal Oscar Rodriguez Maradiaga, who backed the coup. Analysts say the cardinal’s support for the coup cost him political capital; the cardinal is seen much less often in public these days. Bishop Santos, on the other hand, remains highly visible, despite his remote western diocese, which includes some of the poorest communities in Central America. He has been an enthusiastic supporter of the Resistance, the loose-knit coalition of civil groups opposing the government since the coup. However, not everyone would be pleased with a Bishop Santos candidacy. “The decision of the bishop to get involved in politics after stepping down as bishop does damage to the church and damage to politics,” said Jesuit Father Ismael Moreno, director of Radio Progreso, a station closely identified with the Honduran left. “Politics here is historically closely linked to clericalism. So when a bishop or priest decides to participate in partisan politics, that doesn’t help us move toward a political culture of citizenship,” said Father Moreno. “And it would damage the church because he’s not a bishop of unity, rather, he has fostered confrontation. So it would divide Catholics even more than they’re divided now, and not in the name of the struggle of the poor, but rather in the name of party politics. That would harm those in the church who are struggling to serve the community without being interested in achieving quotas of power. It would make a lot of the rest of us look like we’re participating in social movements because we’re interested in personal power,” Father Moreno said. Thelma Mejia, an independent journalist and political analyst in Tegucigalpa, puts long odds on the possibility of Santos being elected president. “While he has backing within one faction of the Liberal Party, he’s not very electable given his polemical nature and his permanent confrontational stance. Hondurans in general don’t like frontal confrontation, and since the coup we’re even more tired of confrontation,” she said. Mejia said the polls show more than 50 percent of Hondurans identify themselves as centrist, independent of the Liberal and National parties, which have dominated the country’s politics for a century. “We need a political leader that appeals to this center, in order to carry out the change that’s needed. And no one from the Resistance nor from the bipartisan tradition has yet appeared who can do that,” she said. Bishop Santos rejects the notion that church leaders should remain outside partisan politics. “It’s very convenient for the rich that the church remains outside of politics, because that way they can mistreat and steal from the poor without the church protesting. They’re happy because no priest will complain. And if one does, they label him a communist,” Bishop Santos said. “Why do I get involved in politics? Because it is politics that has screwed the poor,” the bishop said. 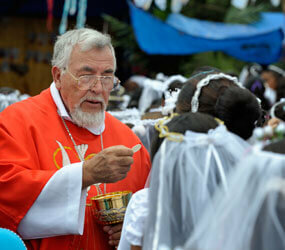 He said most Catholic bishops in Honduras have remained quiet on political matters because they are foreigners. “If they intervene in the internal politics of Honduras, they could lose their residency so, at the end of the day, they remain quiet. But it’s politics that makes people poor, that leaves the clinics and hospitals without medicine, that robs money from the villages. It’s politics that supports the rampant corruption in Honduras. As a bishop, I can’t be disinterested in the health and education of the children, the least of my sisters and brothers,” Bishop Santos said. “This is a rich country, with productive land. But there’s a lot of injustice,” he said. He cited the example of gold mining in his diocese: He said foreign companies fly the gold out of Honduras on helicopters without passing through customs. If he is not elected president, Bishop Santos said, he plans to work with Lenca indigenous farmers in expanding educational opportunities and developing better marketing for their crops.